Dunbar Organic Farm is a small-scale market garden utilizing organic and ecological practices while fostering community connections through involvement with local city youth. The farm is located on FarmStart’s incubator farm in Hamilton. All vegetables are grown without the use of artificial chemicals, pesticides or herbicides and all seeds are GMO-free. 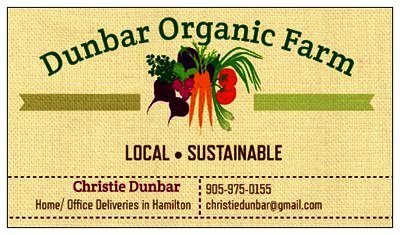 Dunbar Organic Farm supports Neighbour 2 Neighbour Centre and Living Rock Youth Centre with produce donations. Sustainable farming practices include: yearly crop rotation, cover crops, low-tillage methods, saving seeds, using heirloom vegetable varieties and growing pollinator-friendly plants. Beans, Dry—Red Kidney, Black Turtle, Tiger’s Eye.